to a perfect, comfortable pedicure... At Home! Stop” Pedi Larceny”. Don’t pay for another Pedicure… ever again. Saves hundreds of dollars each year. Tired of putting yourself into unimaginable positions to reach your toes? The Stedi Pedi puts your foot into the perfect position to do your own pedicure at home… safely and comfortably. Day or night there is never quite enough light to see well enough for your pedicure. 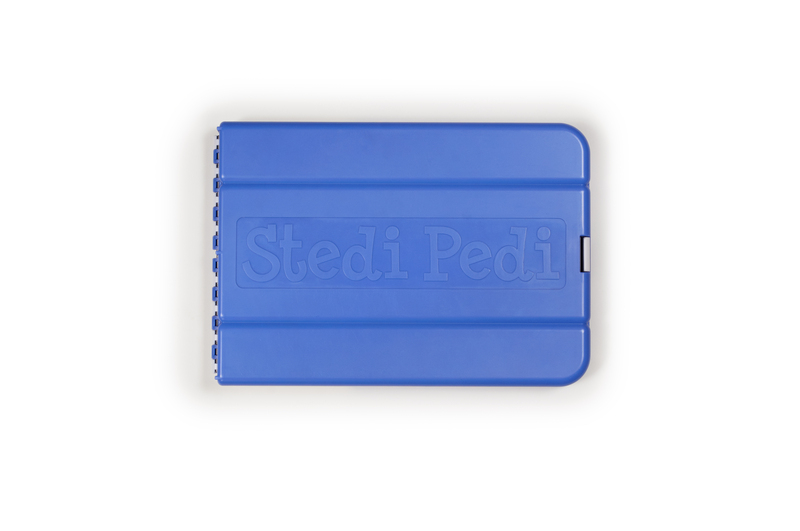 The Stedi Pedi includes a super bright LED task light to brighten up your toes. Compartments on either side of the footpad are perfect for storing your pedicure tools like clippers, files, and cuticle pushers or even your favorite color of polish. The pull out tray in front will catch any errant polish drips or clippings. 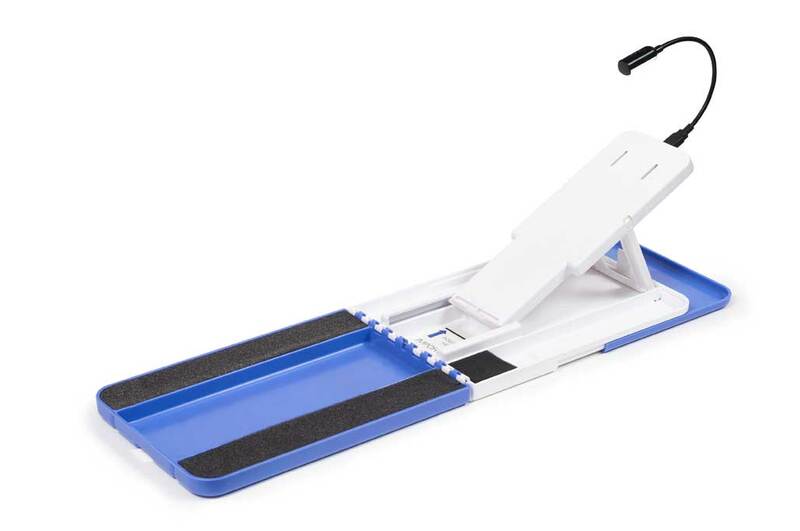 Those with more flexibility can use the Stedi Pedi on any hard surface (a bench, chair or even the floor). Simply sit on a folded towel placed on the back portion of the Stedi Pedi to stabilize the footpad. Slide the back portion of the Stedi Pedi underneath the cushion on your chair or couch. Be sure to push it all the way in to the “Insert Here” line. This positions the foot perfectly for a comfortable pedicure. Those with less flexibility can place it between a mattress and box spring, making sure to push it all the way under to the “Insert Here” line. Your body weight and the mattress will secure the Stedi Pedi in place. How do I setup and use my Stedi Pedi? I have my pedicures done at my local salon. How can the Stedi Pedi help me? There are times when you need a quick touch up between salon visits. The Stedi Pedi is great when you can’t get an appointment for a last minute touch-up at the salon or when you notice a chip in your polish just as you’re getting ready to go out for the evening! Can the Stedi Pedi actually save me money? Obviously, you can save lots of money by doing all of your pedicures at home; however, even with just occasional use, the Stedi Pedi will pay for itself in a very short time. I have seen reports about unsafe hygiene procedures at local salons. Can the Stedi Pedi keep me safe? With the Stedi Pedi, you are in complete control of the cleanliness of your pedicure tools and minimize the risk of contracting dangerous infections from others. Is the Stedi Pedi sturdy enough to support the weight of my leg? The Stedi Pedi is molded of strong ABS material and is specifically designed (when used as directed) to easily support the weight of your leg. Simply push the Stedi Pedi under your cushion or mattress to the line visible in the cavity immediately in front of the footpad. You should not, however, stand on the Stedi Pedi or use it as a stool or step. When using the Stedi Pedi under a mattress, my foot is a little far away for me to see my toes clearly. How can you help? You might consider our lit magnifier accessory to help you get a close up view while doing your pedicure. Can I use the task light, the lit magnifier and the fan to do my manicures as well? Yes, our optional Power Base serves as a tabletop power source so that all accessories can be used for home manicures, too. I can't find my instructions. What do I do? If you have lost your instructions, you may view or download a copy HERE. I love it, It’s so easy to reach my nails and folds flat to store…great idea. StediPedi arrived as scheduled, and works as advertised: took 3 minutes to set up and “mount” under my chair seat cushion, 1 min to plug in and turn on the light, and five to cut ten nails and zero toes. The tray caught all clippings. I sent one to my daughter! Well designed and Works well. My wife is now comfortable when doing her personal pedicures. Thank you very much. This has made pedicures much easier. I love it. Great invention for do- it- yourselfers! So much easier than sitting on the floor! Note that the light won’t turn on until you step on product. Very pleased. This product is amazing. Now my foot stays still while I apply the polish.